I also have a back-up plan. Try reading the fine print on the card. It clearly says "Back-Up Plan: I heard that only 5 people can visit the condo at the time so if this is true, we are moving to Maxine's Cub Condo." I also need helpers to organize the fortune telling, freeze dancing, story telling, fashion show and to take photos. 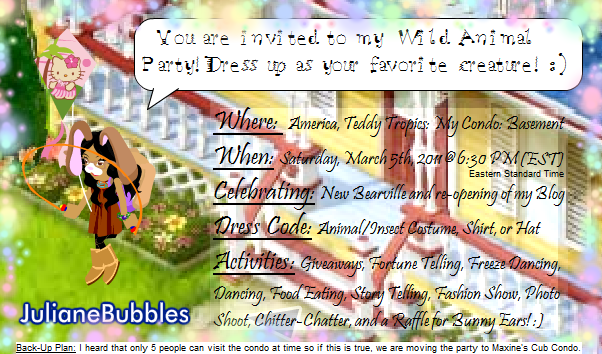 Notice: You only get 2 prizes only (plus ice cream) in the middle of the party. Please do not beg for anything, be thankful I am giving you free ice cream with it XD I don't appreciate people coming to my party just for the prizes, at least stay a while longer? People who come to my party are automatically enrolled in the raffle, if you don't want to be part of it, please tell me. Also, pretty please keep your bears calm! There is a dorm room for all your bears needs. It has 4 beds, 3 bathtubs, 2 fridges, and 1 sink. We don't want your furry friends to be upset at the party either! Yes... we are taking hundreds of pictures I might make a video there too.